The Tico is a small car that was produced by Daewoo. In the 1990s, thousands were imported to Peru, mostly for use as taxis. I don’t think Ticos would be street legal in the US or Western Europe (although I have seen some in Poland), but here in Cusco the fact that they are so small and maneuverable actually made them quite handy. When I first visited Peru in 2005, it seemed like 80% of the taxis in Cusco were Ticos. You see many of them in other parts of Peru as well, but I think Cusco was like the Mecca of Ticos, because the narrow city streets were perfect for the Tico. In Lima you see some Ticos, but when you’re on a major highway like the Via Expressa, riding in a Tico is pretty scary. Considering that most Ticos are used as taxis and circle the potholed streets of Cusco 12 or 14 hours a day, it’s quite surprising that they have lasted this long. However, the Ticos are really showing their age now. In the years since I’ve been visiting Peru, Ticos are noticeably becoming a smaller part of the taxi fleet, with more and more new cars taking their place – mostly Toyota, Suzuki, some European brands as well as the Chinese brands such as Chery and Jac. 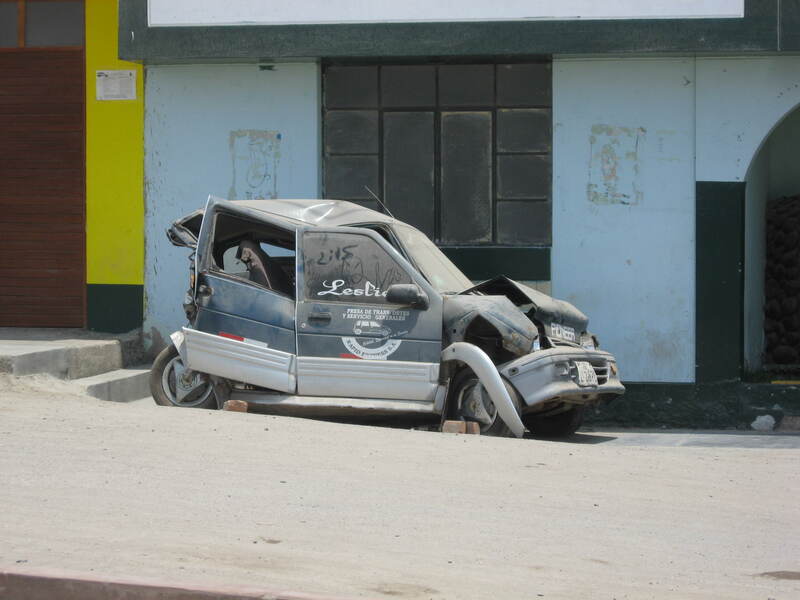 This entry was tagged car, Daewoo, Peru, Tico. Bookmark the permalink. Thanks for the comment Jorge. I did not know that you guys are “Ticos” too! ( first of many trips with my Peruvian wife and daughter). Back in ’98 there were fewer cars….basic “no frills” cars. As the years went by and the economy in Peru really picked up in the 2000s, the Ticos were becoming fewer and more expensive and reliable cars were on the Lima roads ( in the past few trips down, I couldn’t believe the number of Audis, BMWs, and Mercedes in Lima). My family and I did a lot of riding in all kinds of taxis, riding ALOT on Javier Prado highway. We are thinking of the idea of retiring down in Peru. We have an apartment in La Molina near the universities, but I don’t see myself driving on the streets of Lima….